Network 19 (plan B) has been out for a while now. I thought we might be able to see if we can do any better. I have been playing around with some options and suggestions. I'm not sure how much change it will affect, but I guess it's a start. My aim was to change the network with no loss or gain of bus time. I have achieved this using rudimentary google map times. Which, I know aren't exact or very scientific and don't account for layover times or dead running, but is a reasonable guide. I used the frequencies from the original Network 19 (or what I remember of them) to determine bus minutes lost or gained each hour, but that may not be accurate any more. My main philosophy was to bring back through-running of the rapid routes - this means routes can travel as a trunk between major destinations, then fan out in the suburbs to provide more one-seat journeys and reduce the over-serving of some suburban rapid routes. Where routes have been split, I have added a letter suffix. Ie I propose an R2A and R2B. The other way may be to have an R21, R22 combine for the R2 route, but then that requires a whole re-numbering of the network and I didn't really feel like doing that. It could work if the Rapid Routes were numbered roughly in the same order as the routes around them (ie R8 becomes R2, R2 becomes R4 etc...). Maybe I'll play around if I can be bothered. I've also changed routes 180 and 182 to be X80 and X82, so they stand out as peak express routes, and any routes with deviations, making them L18, L54 so they are clearly marked as limited routes. 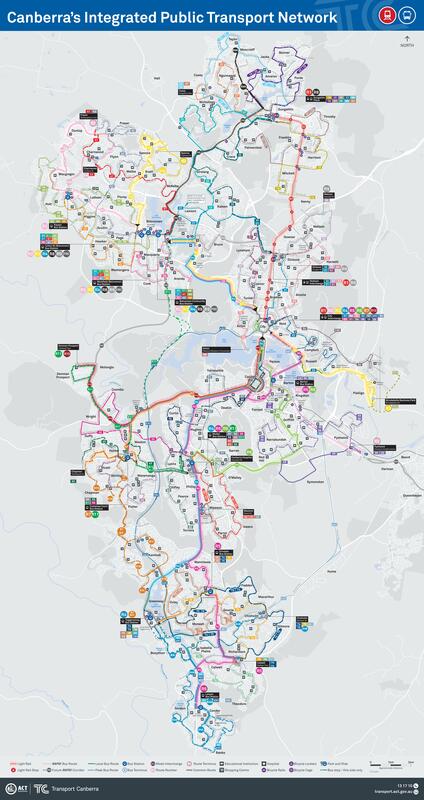 This should help users understand there are routes that don't run 7 days a week or regularly. R2B - Covers old 40/41 through Macgregor/Charnwood - routes through Charnwood switched to allow better access to shops. 63 +6 Route covers Rivett section of old 64. 74/75 -10 Route returns to Tuggeranong via route lost via 72/73 - saves an extra redundant Erindale to Tuggeranong route. In peak +163 - less than 3 extra buses total in peak to cover the extra xpresso routes and the detour of the Lanyon xpresso routes detouring via Tuggeranong. There is high demand for bus travel to the masjid in Spence at prayer times; your proposal to split R3 into separate routes is not only racist, but it also does not address that demand. My post has been translated into a number of languages below; this is to help you understand it. هناك طلب كبير على السفر بالحافلات إلى المسجد في سبنس في أوقات الصلاة ؛ اقتراحك لتقسيم R3 إلى طرق منفصلة ليس عنصريًا فحسب ، ولكنه أيضًا لا يعالج هذا الطلب. Hay una gran demanda de viajes en autobús a la mezquita en Spence en los tiempos de oración; Su propuesta de dividir R3 en rutas separadas no solo es racista, sino que tampoco responde a esa demanda. Il y a une forte demande de bus pour se rendre à la masjid de Spence aux heures de prière; votre proposition de scinder le R3 en plusieurs itinéraires est non seulement raciste, mais elle ne répond pas non plus à cette demande. Có nhu cầu cao về du lịch xe buýt đến masjid ở Spence vào giờ cầu nguyện; đề xuất của bạn để chia R3 thành các tuyến riêng biệt không chỉ phân biệt chủng tộc mà còn không giải quyết được nhu cầu đó. نماز پڑھنے پر اسپینس میں مسجد کے بس کی سفر کا مطالبہ ہے؛ R3 کو علیحدہ راستے میں تقسیم کرنے کے لئے آپ کی تجویز نہ صرف نسل پرست ہے، بلکہ یہ بھی اس مطالبے کو حل نہیں کرتا. Ada permintaan tinggi untuk perjalanan bus ke masjid di Spence pada waktu sholat; proposal Anda untuk membagi R3 menjadi rute yang terpisah tidak hanya rasis, tetapi juga tidak memenuhi permintaan itu. עס איז הויך פאָדערונג פֿאַר ויטאָבוס אַרומפאָרן צו די מאַסדזשיד אין ספּענס בייַ תפילה מאל; דיין פאָרשלאָג צו שפּאַלטן ר 3 אין באַזונדער רוץ איז נישט בלויז ראַסיסט, אָבער עס אויך טוט נישט אַדרעס דעם פאָדערונג. Zu Gebetszeiten besteht eine große Nachfrage nach Busreisen zur Masjid in Spence; Ihr Vorschlag, R3 in getrennte Routen aufzuteilen, ist nicht nur rassistisch, sondern entspricht auch nicht dieser Forderung. ਮਸਜਿਦ ਵਿਚ ਬੱਸ ਯਾਤਰਾ ਸਪੈਨਸ ਵਿਚ ਪ੍ਰਾਰਥਨਾ ਦੇ ਸਮੇਂ ਲਈ ਬਹੁਤ ਮੰਗ ਹੈ; R3 ਨੂੰ ਵੱਖਰੇ ਰਸਤੇ ਵਿਚ ਵੰਡਣ ਦੇ ਤੁਹਾਡੇ ਪ੍ਰਸਤਾਵ ਨਾ ਸਿਰਫ ਜਾਤੀਵਾਦੀ ਹਨ, ਪਰ ਇਹ ਉਹ ਮੰਗ ਨੂੰ ਵੀ ਨਹੀਂ ਸੁਣਾਉਂਦਾ. I feel that route 54 should be removed; route 55 would operate to service Majura Park via Reid and Campbell. I have provided below a link showing the proposed route. During peak periods, routes 56 would operate; this is a service operating to Campbell Park Offices, ADFA, Duntroon, Hospice & Russell; the two services would combine to provide a high frequency service to Campbell and Reid. This link is for route 56, this service is proposed to operate Monday to Friday between 06:30 to 09:30 & 15:30 to 18:30 only. I agree that the 55 and 54 could totally be combined to produce a better route, but I still think that War Memorial needs a closer service and ADFA needs a 7 day, all day service. R11 - City to Denman Prospect via Russell, Barton, Forrest then limited stops to Woden (Girls Grammar, Deakin Shops, Calvary, Deakin HS, CIT), then Cooleman Ct. Replaces the diversion of the old R5.